shallot | eat. drink. cook. travel. Inspired by the pasta I had at Big D’s and also by the past due can of anchovies Mum dug out from the cupboard, I had to have a crack of my own version of the salty fishy stuff. As always when it comes to these weekday dinners, I was famished and tired from yet another long day in the office. In less than 20 minutes, I threw this together using stuff in the house and a mixture of herbs including some sad bits of coriander and spring onion Mum left in the fridge and some freshly bought flat-leaf parsley from the supermarket. Use whatever herbs you fancy, or whatever’s left in the fridge. Anchovies can of course be very salty, but this varies enormously from brand to brand. Just taste as you go along before adding too much. Also, not salting the pasta helps too. I also add some chilli to spice things up a little. Here, I used some aglio olio e peperoncino powder Mum got from Italy (it’s otherwise inedible just on its own with pasta), although simply because it was another past due item begging to be used up. I’d also use fresh chilli or my usual standby of chopped chilli padi. Start by sweating the shallots and garlic gently in the oil from the anchovies till barely golden brown. While still watching the shallots and garlic, boil the pasta in plenty of water till just before al dente. Do not salt the water. Going back to the shallots and garlic, add in the chopped anchovies and stir to break up into a paste. Sprinkle in the chilli and continue to stir. 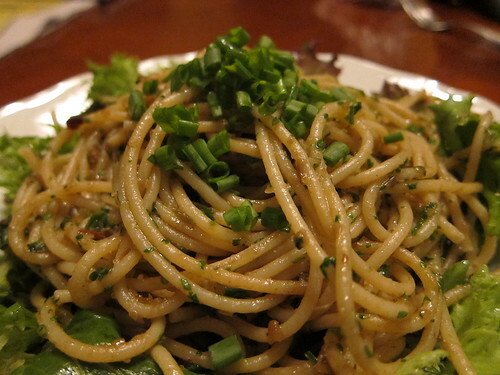 Toss in the pasta into the anchovy mixture, adding in a few spoonfuls of pasta water. Turn up the heat and stir till the water is absorbed and the mixture coats the pasta well. Add a few more spoonfuls of water if the mixture still doesn’t stick to the noodles. Slip in the herbs and stir, stir, stir. I ran out of fresh vegetables one day and was too lazy to venture out for more. As usual, it was time to raid the freezer and find something fairly healthy for lunch. The freezer yielded my usual supply of chopped spinach, petit pois, minced shallots, minced garlic and bacon, and I also found some frozen (!) red chillis. I had some spare eggs and always keep milk in the fridge, so I was pretty much set. There were parmesan cheese and brined green peppercorns in the fridge too, so that I also tossed in. As I put back the peppercorns, I noticed a bottle of anchovies lurking in one of the compartments, so no prizes for guessing what went in next. DC commented that it was a surprise he didn’t break his teeth nibbling on the kitchen sink. 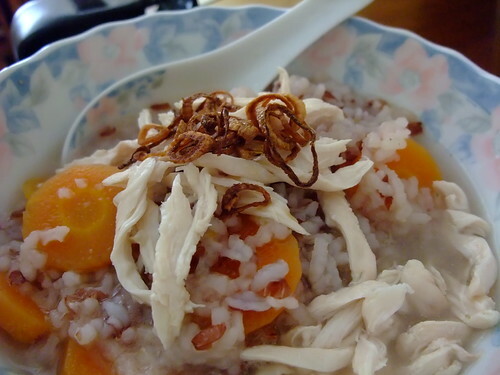 This is a very useful recipe for coming up with something very delicious and fresh-looking and tasting without putting in too much of an effort. 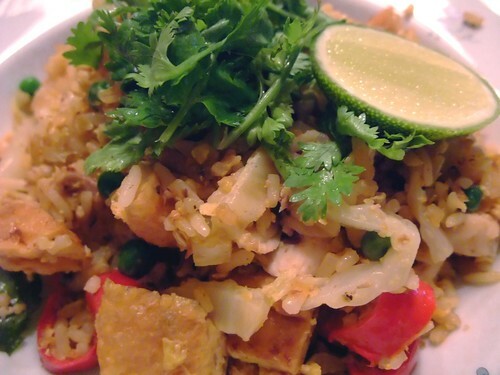 It’s also a bit like fried rice or pizza in that it uses up leftovers. Toss whatever that seems vaguely yummy in it and it should turn out fine. Other things I’d add if I had it would include boiled potato slices, peppers, cheese cubes, tomato, courgettes. Well, pretty much any vegetable really. Go easier on the meat, but if you’re anything like me I doubt you’ll have much leftover meat hanging around anyway. In my recipe I give approximate quantities, just feel free to make it up as you go along. Just make sure that there’s enough egg to barely cover the filling and you’re cool. Melt the butter in a non-stick frying pan and brown the bacon till the fat is rendered. Add the garlic and shallot and saute gently till just fragrant. Don’t allow it to colour. 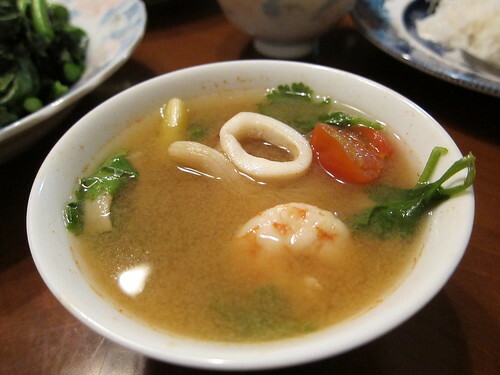 Add in the vegetables, anchovies and green peppercorns and saute till the mixture is hot. Set aside in a bowl. In another large bowl, beat the milk and eggs together, then pour it onto the hot pan. Quickly spoon the hot spinach mixture over and spread gently. Stir very gently along the top of the frittata so that the egg and filling will mix. Turn the heat to low and cook till the middle is almost set, 5-10 minutes. Now’s a good time to preheat the broiler. When the top looks almost set, i.e. still wobbly but not liquid, transfer to the broiler and cook till set. Grate over a very generous layer of parmesan and return to the broiler. Cook till cheese is melted and brown. Remove from heat. 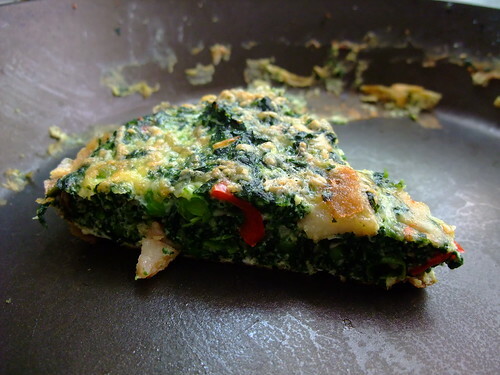 Very carefully loosen the sides of the frittata with a spatula and invert onto a plate. Use kitchen gloves. Cut into wedges and serve with fresh brown bread. As always, I hoped to finish up some things languishing in the fridge. I had two sad lemons and some fairly fresh coriander waiting around. A quick trip to the supermarket got me basil instead of the flat-leaf parsley I was hoping for, but rooting around in the freezer got me some butter and chopped shallots. I meant to have some kind of meat with this but was too tired to sort that out, so it was just chopped herbs and butter in this simple clean-tasting pasta. I’m sure this would go amazingly with some grilled fish, although DC thinks it’ll be phenomenal with lamb rack. We’ll just have to try both out before deciding! Boil the linguine in plenty of salted water till just approaching al dente. In a hot pan, melt the butter then gently saute the onions till slightly coloured. Add the vermouth, turn up the heat and bubble till reduced by half. 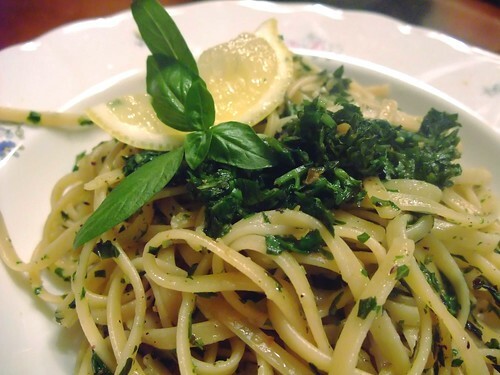 Toss in the pasta, chopped herbs and lemon zest. Stir over low heat. If the pasta is not yet al dente, add a little of the water used to boil the pasta and stir till ready. Check seasoning and serve garnished with a lemon wedge and a sprig of basil. I was a little tired of having the usual cheese or peanut butter in my breakfast sandwich. Inspiration hit when I looked at eggs and cheese sitting around in my fridge. I wasn’t happy with just a plain cheese omelette. There was some aging garlic and shallots in a corner of my kitchen, so that went into my recipe, as did some defrosted chopped spinach. I went slightly overboard with the butter for my omelette but that made it extra special and flavourful to perk up my breakfast. I suppose it also helped keep the omelette from sticking to the pan. DC insists that I add this line: he thinks it was very nice. Melt the butter in a frying pan on medium heat, then add the garlic and shallots. Fry till the shallots are soft and start smelling wonderful. Fish the garlicky shallots out into a large bowl and mix in the spinach and cheese. Season with sea salt and a generous grinding of black pepper. Stir till well combined. Put the still-buttery pan back on medium, then briskly beat the eggs and milk together. Pour into pan and let set. If bubbles form, burst them with a wooden spatula to help it cook faster. 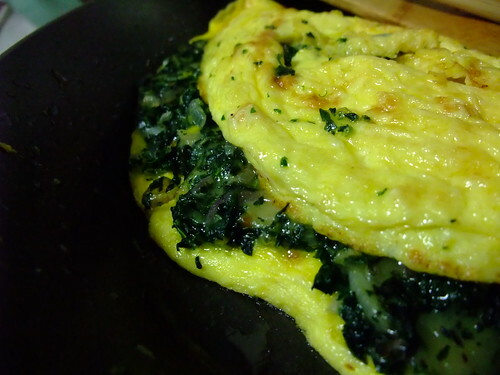 When the omelette has just about set, smear the spinach and cheese mixture gently onto one half. Carefully fold the omelette over and wait for the cheese to melt. Serve as soon as you can, though it tastes gorgeous cold too.